www.xylitolusa.com and www.xylitolcanada.com) . If you can’t get hold of it (and unfortunately it can be tricky in Europe), drizzle Sweet Freedom or agave nectar over the pancake. 1. Pre-heat the oven to 200C/400F/gas mark 6. Grease a round 30 cm (12 inch) tin liberally with vegetable oil and put it in the oven to get hot while you prepare the pancake. 2. Put the flour, xylitol and salt into a bowl and mix. 3. Make a well in the middle and add the eggs. Mix thoroughly. 4. Stir in the cream, then the water. Set aside. 6. When the oven has reached the desired temperature, take out the tin and place the plum slices in it. 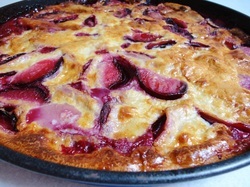 Pour the batter over the plums and put the tin back in the oven. Bake for about 20 minutes or until the pancake is golden brown. Don’t open the oven door until you’re ready to take the pancake out or the sides will flatten. 7. Drizzle some xylitol maple syrup, Sweet Freedom or agave nectar over the pancake and serve. If you don’t tolerate lactose, use lactose-free cream instead. You can find more pancake recipes in No Naughties' Pancakes.